The Apollo® Model FF Fast Fill/Feedwater Pressure Regulator provides the heating boiler with make up water at reduced inlet pressure with a high capacity purge / quick fill capability. They are manufactured in the US from proven ASTM grade materials for corrosion resistance and long life. Cartridge is replaceable in-line. The Apollo® Model FFB Combination Backflow Preventer and Fast Fill Pressure Regulator is designed to protect residential and commercial potable water supply lines from back-siphonage or backpressure on Hot Water Heating Boilers. 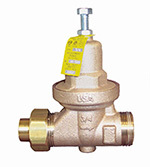 An intermediate atmospheric vent ensures positive protection from backflow conditions. The pressure regulator provides boiler make up water at the desired pressure and includes a purge/quick fill feature. 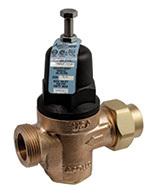 Direct Acting, 1/2" to 2"
The Apollo® Model PR (36 Series) Pressure Reducing Valves are designed to protect residential and commercial water distribution systems by controlling excessive pressures. The valves are built for long reliable service with proven ASTM grade materials including a bronze body and stainless steel strainer. 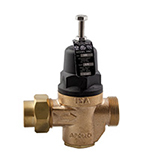 Compact Direct Acting 1/2" to 1"
The Apollo® Model PRC (36C Series) Pressure Reducing Valves are designed to protect nonpotable water distribution systems by automatically controlling excessive pressure changes. The valve's integral thermoplastic cage provides maximum corrosion resistance. Designed for easy in-line servicing with bottom cleanout access to seat disc and strainer. The Apollo® Lead Free Pressure Reducing Valve Model PRC (36CLF Series) is designed to protect residential and commercial water distribution systems by automatically controlling excessive pressure changes. The Apollo® Model PRE (36E Series) Pressure Reducing Valve is designed to conserve water and protect water distribution systems by automatically reducing elevated supply pressures. Ideal for industrial and irrigation applications. The dezincification resistant bronze body and dielectric polymer cage provide maximum corrosion resistance. Designed for easy in-line servicing with simple cartridge removal. The new large diameter Apollo® Model PRE (36E Series) Pressure Reducing Valve is designed to conserve water and protect water distribution systems by automatically reducing elevated supply pressures. Ideal for industrial and irrigation applications. The dezincification resistant bronze body and dielectric polymer cage provide maximum corrosion resistance. Designed for easy in-line servicing with simple cartridge removal. The Apollo® Lead Free Pressure Reducing Valve Model PRE (36ELF Series) is designed to conserve water and protect water distribution systems by automatically reducing elevated supply pressures. The dezincification resistant bronze body, stainless steel adjusting screw and dielectric polymer cage provide maximum corrosion resistance. Designed for easy in-line servicing with simple cartridge removal. NEW! - Lead Free "Direct acting cartidge style regulator designed for maximum economy and efficiency". 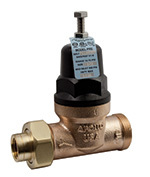 Working Temperature Range: 33° F. – 180° F.
The Apollo® PRH (36H Series) Pressure Reducing Valves are designed for commercial, industrial, and institutional applications to reduce incoming water pressure for protection of plumbing system components and to reduce water consumption. The Apollo® Model PR-LF (36LF Series) Pressure Reducing Valves are designed to protect residential and commercial water distribution systems by controlling excessive pressures. 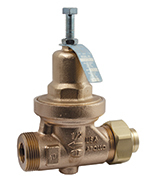 The valves are built for long reliable service with proven ASTM grade materials including a Lead Free bronze body and stainless steel strainer.